Conservationist in Nepal say they are concerned that former Maoist rebels have not yet returned wildlife products they had seized during the nation's 10-year conflict. Wildlife officials are calling for any items taken off poachers and traffickers to be handed over, especially as a number of the Maoist Party leaders are now members of the coalition government. 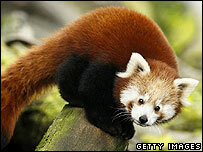 No official records exist of the confiscated animal products, but a number of conservationists say they have documents listing seizures. The Maoist forestry minister said he was not aware of any wrongdoing by party members, but added he would launch an investigation if information was presented of goods being withheld. Wildlife Conservation Nepal (WCN), which has been involved in undercover operations to identify poachers and wildlife traffickers, said it has records of an incident that took place in April 2006. "Three people with two tiger skins and three leopard pelts were caught by locals in the southern town of Birgunj, bordering India," said Prasanna Yonjan, the head of WCN. "The three were then handed over to the Maoists' People's Liberation Army, which seized the wildlife contrabands from them but has never returned them to the government." Mr Yonjan added that the three traffickers were freed after lobbying by a poacher who himself was later arrested. 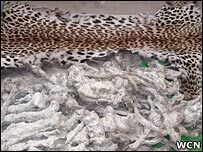 Another conservationist working for an international organisation in western Nepal said two people that were caught with tiger bones were taken away by Maoists in June 2004. "The two, one of them a retired policeman, were taken to the mountain district Jumla by the Maoists," the conservationist added. "The Maoists later freed the two but the tiger bones were never returned." The Bardia incident was confirmed by a Department of National Parks and Wildlife Conservation official, who asked not to be named. "Many such incidents took place during the 10-year conflict," said Mangal Man Shakya, head of Wildlife Watch Group, an organisation affiliated to the World Conservation Union (IUCN). "But the Maoists have never returned to the state the wildlife products they had seized. "We have been asking the Maoist leaders to do so but there has been no response." Forestry Minister Matrika Prasad Yadav, a Maoist leader, told the BBC that he was not aware of any wildlife products seized by party members. "If any organisation or individual provides us information in this regard, I can launch an investigation within our party," he said. Conservation groups suggested that Mr Yadav may not have be aware of the problem because he spent the majority of the decade-long conflict in prison. One of the Maoist army's deputy commanders, Nanda Kishor Pun, also known as Pasang, acknowledged that seizures had taken place within lower levels of the party. "But that was clearly against our party policy and we hope that this BBC report will help us probe into such issues," he said. Wildlife groups are concerned that an increase in poaching and trafficking has led to a decline in the population of a number of endangered species. Figures from the Department of National Parks show that 150 rhinos have been killed by poachers in the past eight years. Department officials were able to record these deaths because the animals' carcasses were left behind after the horns had been removed. The level of poaching of other endangered species, such as tigers, leopards and red pandas, is much more difficult to track because poachers remove the whole animal. Although there has been no detailed study into the number of animals killed, officials say initial reports show animal sightings in some national parks have gone significantly down. Nepal has 16 protected zones that cover almost 20% of the country's land area. These areas had been protected by the government's army but the Maoist insurgency, which began in 1996, saw many soldiers being redeployed elsewhere to fight the rebels. Maoist leaders have denied any involvement in wildlife poaching or trafficking. "Our party never had the policy of making income through such means," said Minister Yadav. The Maoist Party's youth wing, the Young Communist League, recently won praise from conservationists after its members seized huge amount of red sandal wood that was being smuggled from India to Chinese controlled Tibet via Nepal. Several reports have suggested that Nepal is increasingly becoming a transit point for wildlife trafficking, particularly between India and China.